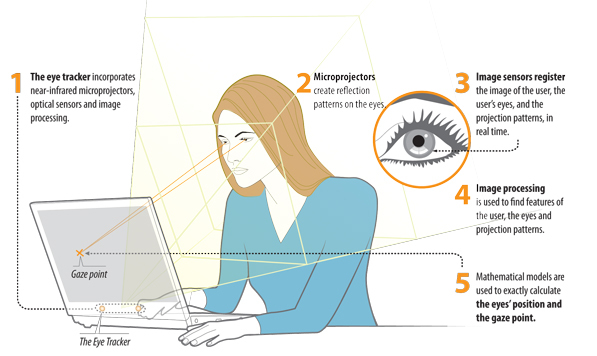 Of all the new user interface possibilities that are out there, eye-tracking is one of the most intriguing. Yes, it’s a bit creepy – where you look can say a lot – but it also holds great promise for those with physical impairments and can make reading on mobile devices a bit easier, as shown in Samsung’s Galaxy S4. One of the leading companies in this space is Sweden’s Tobii, which has been around for a good dozen years and took a hefty $21 million funding round in 2012, led by Intel(s intc) – a firm that’s always on the lookout for new user interface technologies. On Wednesday, Tobii said it would launch a developer kit early next year that will make it much easier to build applications that use eye-tracking for scrolling or what-have-you. These could be games or other sorts of apps, but they will all be based around tech included in Tobii’s advanced EyeX Controller and EyeX middleware, which along with a new software development kit (SDK) constitute the $195 developer package. Tobii reckons there are many uses out there: accessibility for those with disabilities; interfacing with computers in specialist environments, such as hospitals, where traditional UI methods bring hygiene problems; and also in cars and trucks, where checking for signs of tiredness can be a lifesaver. And then there’s the marketing potential. Of course, it’s not necessarily a matter of just using eye-tracking as an interface method; the clever stuff comes when you mix it with other kinds of interaction, such as voice. Anyhow, real-world use cases will come from the developers playing around with possibilities, and at $195 — way cheaper than the $995 Rex dev kit, although that’s now discounted to $295 – the EyeX kit looks like an excellent way to start. Pre-orders are open now, and the kit will ship in March.